As you know, when I notice new things, I like showing them to you. There is just so much to see in the National Museum of the Marine Corps. You can't and won't be able to see it all. Being a regular, you get used to things being a certain way. A lighting level, particular items being in a case, or a display. It is amazing how quickly you notice changes. Or maybe I'm just sensitive. Saturday, the Iwo Jima gallery was darker than usual. The other docent said it was usually that dark. No, not THAT dark. I quickly noticed a string of overhead lights that had not turned on. Well, we've had some empty cases for over two years. Then all of a sudden, artifacts started to appear. 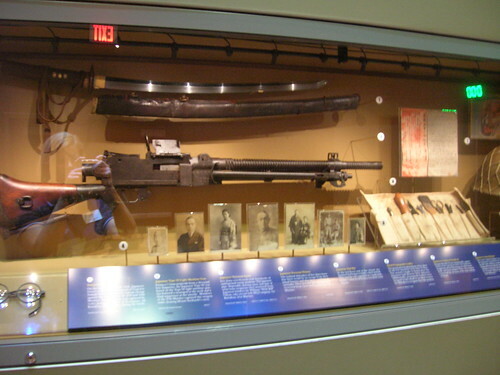 For instance, these Japanese personal items collected by Marines on Iwo Jima. I don't think US Servicemen can smuggle swords and rifles back in their personal gear any more. Since I am a picture person, I find the personal photographs to be the most interesting. The enemy is always demonized, yet the enemy is no different than we are. There are wives that the men knew they would never see, proud fathers the young men wished to honor by their service, and siblings - a brother - who was also serving in the emperor's army. Memories of stolen kisses, family dinners, boyhood pranks played with a co-conspirator. I wonder how often the owners of these photos looked at them and thought to the days before the war? 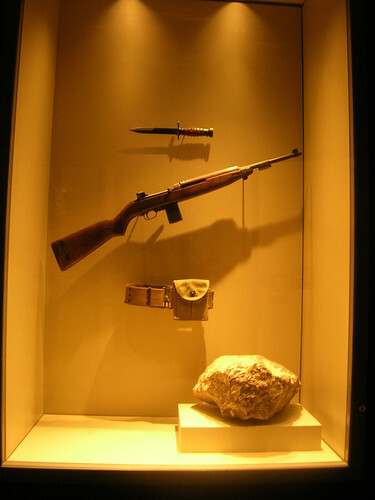 In the Korean gallery they have added some items that Marines would have been equipped with while landing at Inchon. That big chunk of rock, part of the sea wall. Artifacts belonging to Marine Corps leadership at the Inchon landing fill another case. 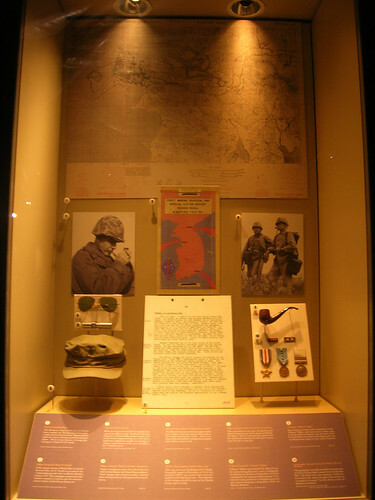 The ribbons on the right, "Chesty" Puller's Korean War awards and his pipe. The map in the back ground is an Inchon landing map and in the middle of the case is an action report about the Inchon landing. Work continues in Semper Fi Memorial Park, it hasn't changed significantly enough for me to post the pictures I have taken. They are building the road to the chapel before they start anything with the chapel. Construction on the chapel is to begin this fall and should be completed in the spring. Construction on the new galleries is also to begin this fall. Have You Seen This MoveOn.Org Ad? "Its So Nice to Be Talked To Like A Human Being"
How Do You Explain a CAP to an 8-year old?